First I just want to say that this week I got some pretty exciting Wonder Woman news. There’s going to be another Wonder Woman series in addition to her own comic and Superman Loves Wonder Woman or whatever that one’s called. Coming up in August is Sensation Comics Featuring Wonder Woman, an anthology title featuring Wonder Woman stories outside of New 52 continuity (thank Hera for that! ), and first up is one of my faves, writer Gail Simone! So it’s like Adventures of Superman or Legends of the Dark Knight, in that an ever-changing group of creators can just tell Wonder Woman stories without worrying about how they fit into the current status quo. Coming after the horrific news that David Finch (who had the honor of creating the hands-down worst of the new Batman series and whose depiction of Wonder Woman already became a popular object of internet mockery) will be taking over the main Wonder Woman title after Brian Azzarello and Cliff Chiang finish up their arc, this new announcement is a breath of fresh air. Sensation Comics is the first bit of Wonder Woman-related good news I’ve heard in a while. Anyway, on to this week’s write-up! 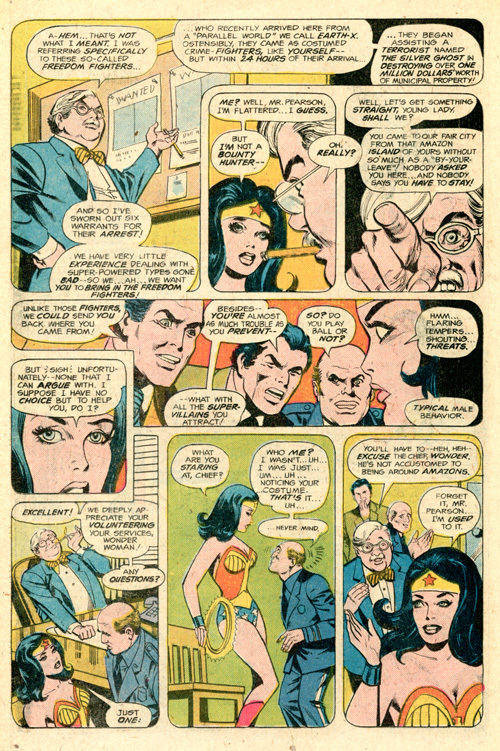 So last week I covered Wonder Woman’s two-part adventure at the end of 1976 (WW #226-227). I do want to talk about what happened in the following issue, but first I want to point out something interesting that happened in between those issues. Wonder Woman appeared on the cover of six different comics in December 1976 out of the 32 that DC published that month—and that’s not including her own series, which had long been published bimonthly and was between issues that month. She was having new adventures in Brave and the Bold #131, DC Super Stars #10 (presenting Strange Sports Stories), Freedom Fighters #5, Justice League of America #137 and Super Friends #2, and had reprints of her Golden Age stories in Four-Star Spectacular #5. Now, a lot of those are team books, but still, hat’s a lot of Wondy on the stands at the same time. This could be a coincidence, but I think it’s far more likely that DC was capitalizing on the Wonder Woman TV series that was starting around that same time. (Remember, comics are often dated for a few months after they actually come out.) So I thought it would be fun to take a look at a couple of these extracurricular adventures before the abrupt change of setting that happens in the next issue of Wonder Woman. I’d say it should be obvious that they’re all good guys here, but Uncle Sam does look pretty sinister. 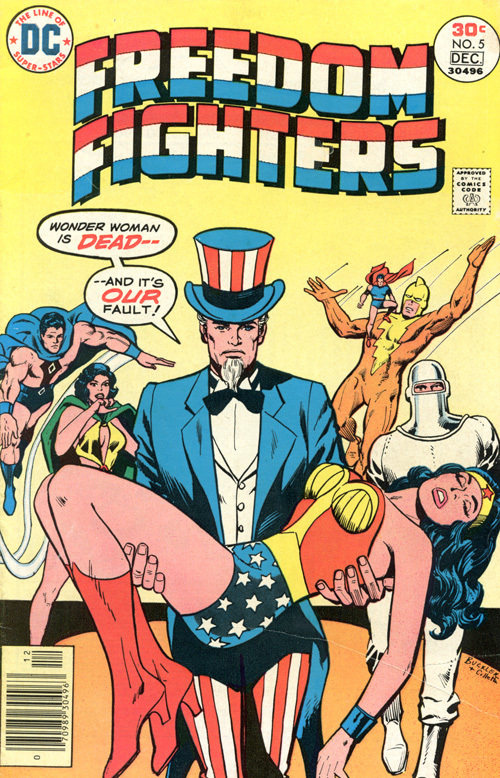 Freedom Fighters #4, DC Comics, October 1976. How best to explain the Freedom Fighters? They’re a bunch of 1940s superheroes that DC Comics acquired from the defunct company Quality Comics in 1957. Unlike a couple of better-known former Quality properties, Plastic Man and Blackhawk, DC didn’t start using these heroes right away. This issue’s story is by Martin Pasko, the regular writer of both Freedom Fighters and Wonder Woman at the time, although he’d be replaced on FF in the very next issue. The art is by Ramona Fradon, the great longtime Aquaman artist. Now the Freedom Fighters are wanted by the law, and just come barging into the United Nations to claim diplomatic immunity as unappointed representatives of another earth. Yeah, good luck with that. Naturally guards try to stop them, and the Freedom Fighters get into a big fight with them. I’m sure this will do wonders for their case. And hey, you know who works for the UN? Diana Prince, alias Wonder Woman! And it just so happens that the star-spangled Amazon had recently been called in to help catch the Freedom Fighters by District Attorney Pearson, who had become their nemesis. We hear all about it in a flashback that contains way more comic relief than usual for Pasko’s Wonder Woman. Yeah, he probably means a little more specifically than that, wiseass. There are some comical misunderstandings, some not-so-veiled threats, and some straight-out leering. So of course when the FF come to her own place of business, Diana quickly changes to WW and leaps into battle. Because that’s what heroes always have to do when first they meet—assume each other’s a threat and fight each other. That leads to a bit of old-fashioned chauvinism about not fighting a girl, but to be fair, Uncle Sam is about 200 years old. 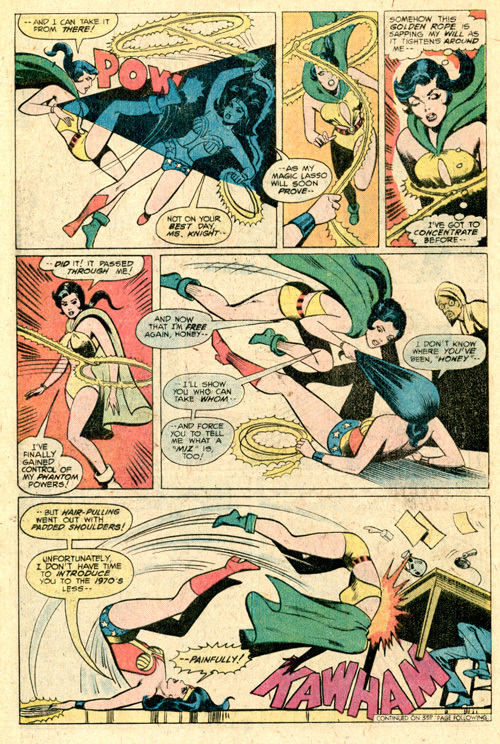 Apparently they’re all old-fashioned, because when Wonder Woman has to fight Phantom Lady, because they’re both gals, there’s a gag about PL not knowing what the heck “Ms.” means. I guess the Nazis didn’t go for women’s lib. Mind you, to make this joke work, Wonder Woman has to call Phantom Lady by her real name, and I have no idea how she learned that, because they haven’t been properly introduced, living on entirely different earths and all. That DA must have very complete files. Or the Justice League do, even though Wondy wasn’t around when they met the team from Earth-X. Whatever it means, I’m sure it’s fighting words. Because Wonder Woman is awesome, she manages to capture the Freedom Fighters and assure them she’s on their side even as she transports them to the DA as requested. But almost no sooner does she arrest them than she takes half of them out with her again, because one of their enemies is on the loose and they have to stop him. Their archenemy, Silver Ghost, is supposedly dead, but one of his henchmen, a big dumb strong guy named King Samson, is on a rampage with the Ghost’s glove that turns anything to silver—even, tragically, his mom, driving him insane. Wonder Woman gets taken down almost immediately in the fight with King Samson, presumably because this isn’t her comic and the others have to save the day. Not only does Samson break her unbreakable magic lasso by turning it to silver (whaaaat?) but then he turns her to silver too. And apparently the glove has gone haywire and threatens to make Manhattan crumble, and only Diana knew how to stop that from happening. And now she’s dead! What are these mixed-up heroes going to do? There aren’t nearly enough Pieta homages in comics. 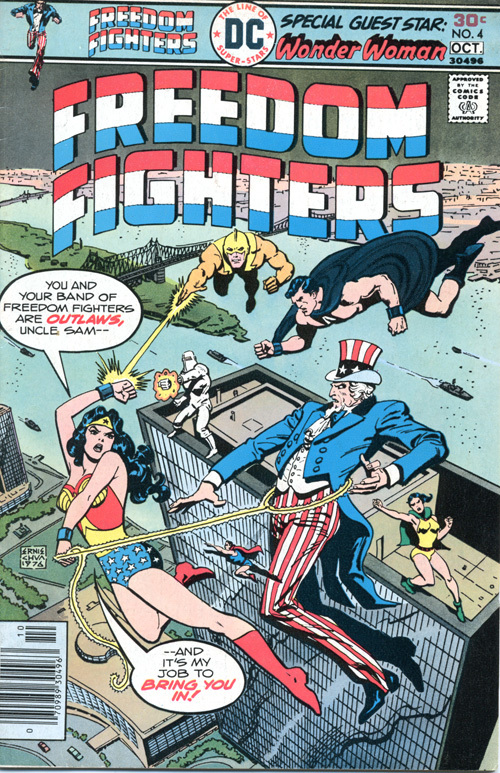 Freedom Fighters #5, DC Comics, December 1976. Because Wonder Woman’s dead, she’s hardly in the next issue, written by Bob “The Answer Man” Rozakis. 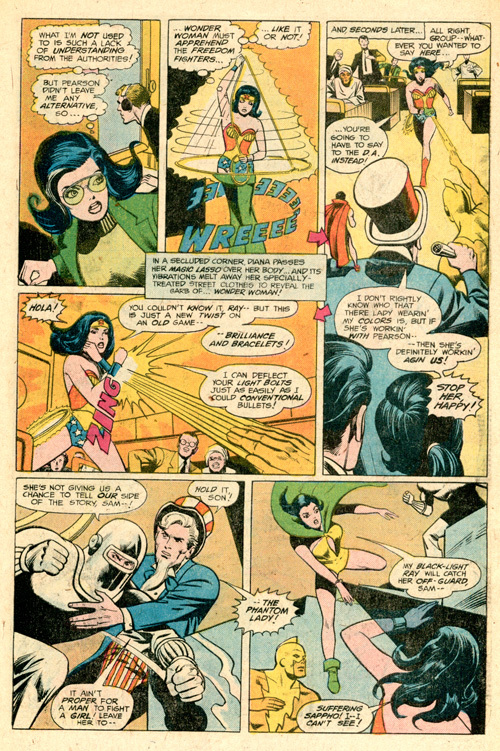 But Phantom Lady happens to remember what none of the boys do, that Wondy can be brought back to life if they just turn her back to flesh and blood again. Oh yeah, good thinking! You’d think that wouldn’t be the kind of thing you’d forget. 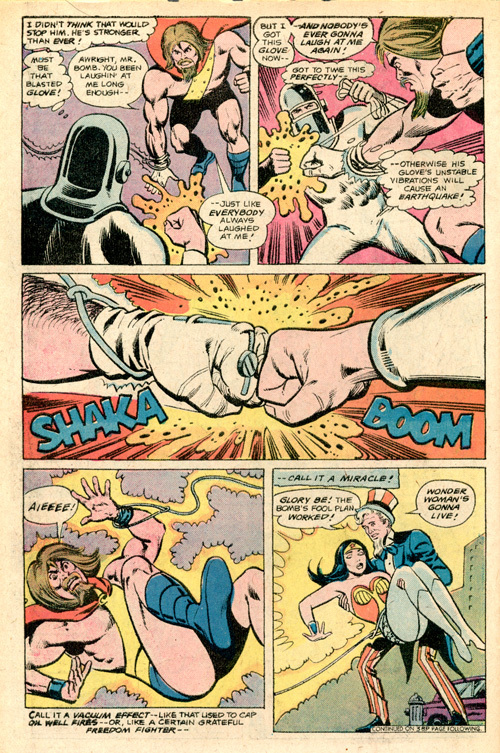 The Human Bomb figures out some way to reverse the process by punching his hand that makes things explode against Samson’s hand that makes things turn to silver, and the feedback traveling through the lasso returns Wonder Woman to herself, although she’s still knocked out. And yeah, that doesn’t sound like it makes any sense, but trust him, he’s a scientist. Yeah, “fool plan” just about covers it. But it doesn’t make the unbreakable lasso any less breakable to Samson, apparently, because he breaks it again, creating even more feedback that travels across town and brings the Silver Ghost back to life. And yeah, I’m not even going to try to make sense of that. 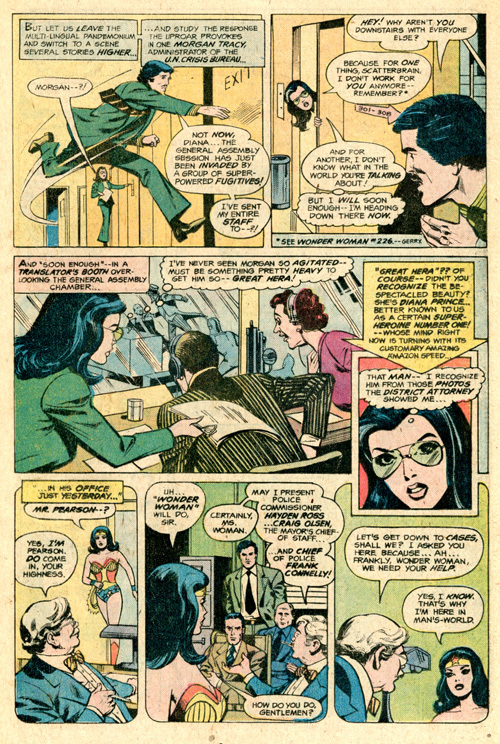 There’s some other drama in here, such as Doll Man meeting the Earth-1 duplicate of his dead girlfriend from Earth-X, but we can pretty much skip over that, because it doesn’t have anything to do with Wonder Woman. And she’s out of action for the whole issue, while the FF fight Samson and the Silver Ghost, so in fact we can skip over pretty much all of it. 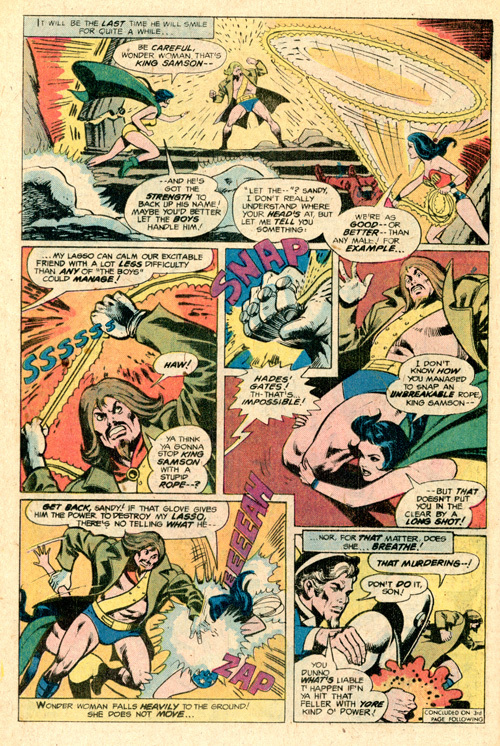 The DA tries to capitalize on Wonder Woman’s death to make more of a case to the general public that the Freedom Fighters are menaces to society and plans to charge them with murder, only to be foiled when she shows up very much alive at the end. But they’re still fugitives at issue’s end, so in that sense not much has changed. “The” Catwoman? Someone’s been hanging out with the Batman too long. The Brave and the Bold #131, DC Comics, December 1976. 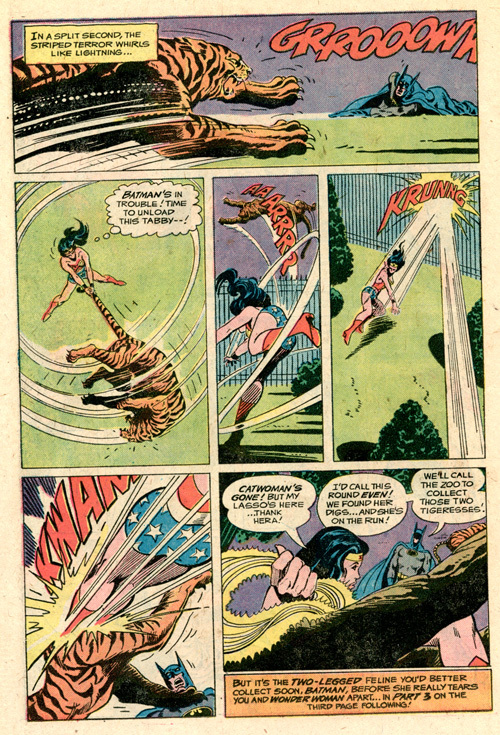 Hey, it’s yet another Batman/Wonder Woman team-up in The Brave and the Bold, by the dream team of writer Bob Haney and artist Jim Aparo (who’ll always be “my” Batman artist, because I grew up with his version in this very series). And as usual with Haney stories, it doesn’t make a whole lot of sense. The cover calls it “Day of Tigers… Night of Death!” and the actual title is “Take 7 Steps to…Wipe-Out!” As for what the latter means, your guess is as good as mine. 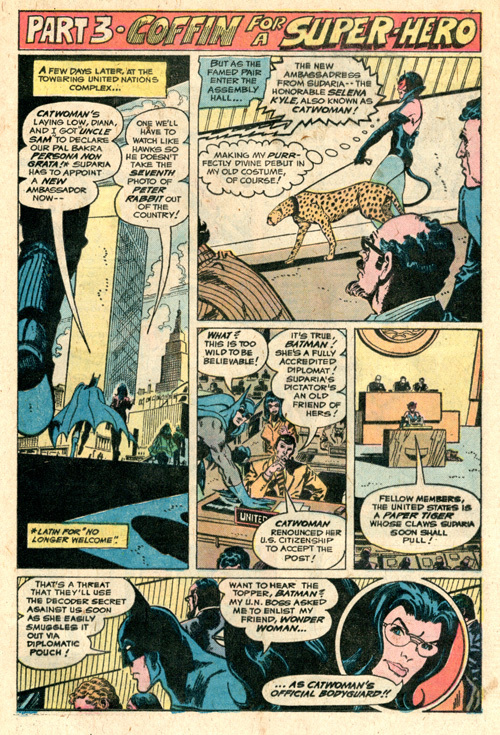 The ambassador of the fictional North African nation Sudaria is killed by jaguars in his limo, so Batman deduces that his old enemy Catwoman must be behind it (and at the time she was still an enemy, which is funny because that hasn’t been true for a long time), because only she could train cats like that. I’m quite sure that’s not actually true, but never mind. 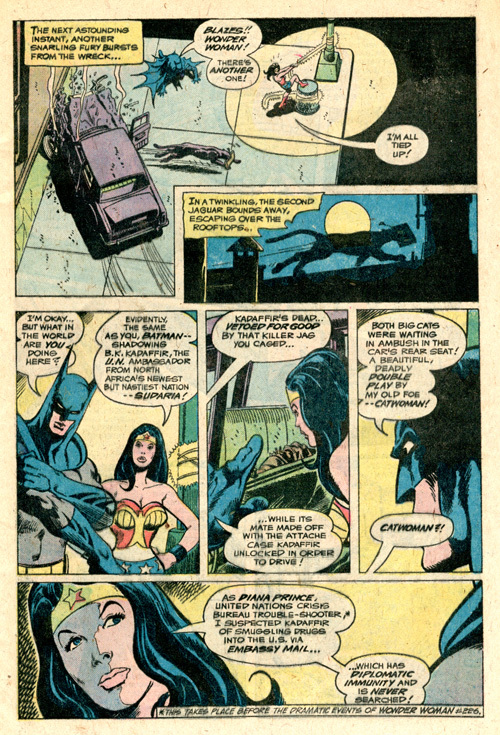 Wonder Woman actually teamed up with Catwoman (along with Fafhrd and the Gray Mouser) four years before this, but she shows no sign of remembering that. I love that Haney’s Batman talks like a beatnik. The ambassador was apparently the only honest man in a corrupt government, so of course he had to be rubbed out. Batman takes Wonder Woman to meet a spy acquaintance of his codenamed “Uncle Sam,” which is funny considering that she was off on an adventure with another Uncle Sam in another comic that same month. This guy explains that the blueprints for the world’s most advanced decoding machine, called Peter Rabbit, are being sold piece by piece to Sudaria, presumably by Catwoman—or so Batman insists. After that, well, a bunch of stuff happens. Believing a piece of the blueprint is being smuggled to the new acting ambassador inside an auctioned cat statuette, Bruce Wayne gets into a bidding war with the guy and of course wins, because he’s just that rich, but it turns out the statuette is a bomb! Oh, that tricky Catwoman. I have to say, this Catwoman is way more into killing people than she’d become later on, although she’s still just in it for the profit, the shiny things, and the cat fetish. 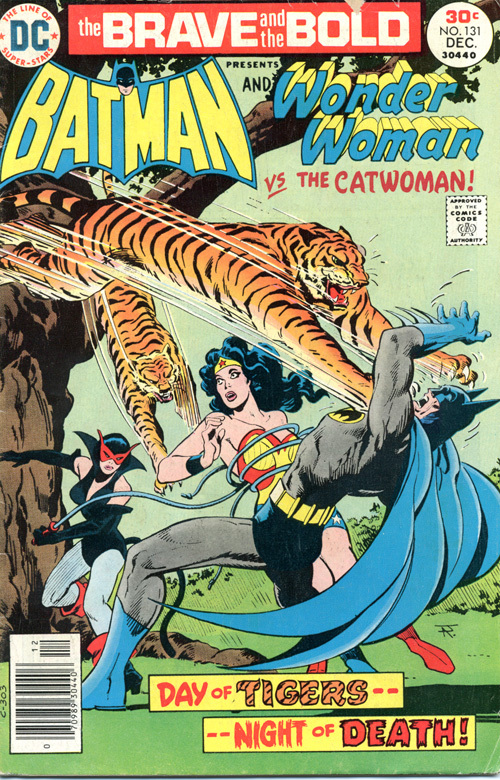 Then Batman just decides to let a jaguar loose and follow it back to Catwoman’s lair, which works surprisingly well, but the crook gets away while Bats and WW are fighting her tigers. It’s a cat-astrophe! And of course Haney uses that pun later on. This is getting mighty weird mighty fast. But Wonder Woman turns out to be a terrible bodyguard, because on the very next page Catwoman’s supposedly dead, her body being shipped to Sudaria. Of course, Batman suspects that it’s all a ruse to smuggle the last piece of the puzzle without getting searched by customs (not that they’d ever really do an extensive enough search to find a photograph anyway, but the whole story hinges on us not thinking too hard about that little detail). And of course he’s right because the coffin’s full of more killer jaguars! And the film is actually in Wonder Woman’s invisible jet! But Catwoman just had to gloat to Batman about that very fact in her prerecorded message, because surely he could never survive her deadly cats like he always has before, so he just calls Diana, and that’s about the end of that whole plot. Pretty anticlimatic after all those twists and turns, but, well, that’s Haney for you. This is the story in all of Pre-Crsisi DC Canon where Catwoman was a killer, the very next comic to feature makes a plot point out her not being capable of killing (which Batman is thought dead and Catwoman tried to claim the credit). Catwoman costume is also complellty unique to this story, and I think it’s a shame it’s not well known enough to inspire Cosplay. Well, the costume isn’t truly unique to this story. She wore it in Batman #210 & 256, Wonder Woman #201-202 (linked above in my writeup), the cover of The Joker #1, and some other places. But it was pretty short-lived, anyway. Not as short-lived as the green one she wore before this one, though. That Costume is similar but not exactly the same.